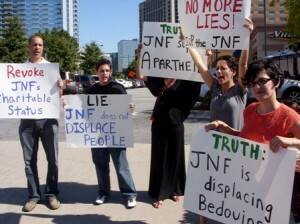 What is the campaign to stop the JNF? How can we stop the JNF? Join the campaign in your region to Stop the JNF. In addition to the ongoing struggles against the JNF in Palestine, the campaign is underway in Britain, Canada, France and the United States. The mission of the Jewish National Fund (JNF) inspires not only the creation of an exclusive and discriminatory Jewish state, but also the destruction of Palestinian land ownership, community, livelihood, and the land itself. For decades, lawyers, Palestinian property owners, community members and activists have been exploring ways to challenge the JNF. In this moment of increasing potential to confront the impunity of Israeli, Stop the JNF has emerged as an internationally coordinated campaign to build upon the foundations these challenges have laid. Palestinian people, communities and organizations have been fighting the concrete results of the JNF for over a century. Organizing, protesting, refusing to leave in the face of bulldozers and weapons, pursuing legal cases, surviving dislocation and the destruction of their agricultural lands. Not giving up hope and instilling in one’s children a sense of identity tied to place and history is a powerful form of resistance. The efforts of Palestinians to confront the JNF have been joined by efforts in Canada, the United States and Europe. Canadians Against Israeli Apartheid have organized extensively to expose and denounce the JNF’s building of Canada Park with support from Canadian tax dollars. This park was build on top of three villages – Beit Nuba, Imwas and Yalu – that were occupied, bulldozed and demolished in 1967. Uri Davis, has been supporting this and similar work against the JNF for decades. As early as 1988, he authored The Jewish National Fund with Walter Lehn. BADIL, the Resource Center for Palestinian Residency and Refuge Rights, and the Housing and Land Rights Network of the Habitat International Coalition, have brought evidence to the United Nations to challenge the consultative status of the JNF. Building on all of these efforts, the Stop the JNF campaign will expose the JNF’s anti-charitable history of political and financial support and military intelligence for the ethnic cleansing of Palestine. This history includes building parks and forests to hide villages destroyed in 1948 and 1967. Current projects include land and water theft from Bedouin communities in the Negev and illegally acquiring lands and houses in occupied Jerusalem through its private subsidiary Hemnuta. The first meeting to build the Stop the JNF campaign was held in Geneva in May 2009, during the World Conference Against Racism/Durban Review and the shadow Israel Review Conference. Plans to build the campaign were started at this meeting with the Habitat International Coalition (HIC), the International Jewish Anti-Zionist Network (IJAN), the Palestinian Boycott, Divestment and Sanctions National Committee (BNC), the Scottish Palestine Solidarity Campaign (SPSC). In May, 2010, these organizations co-sponsored an organizing meeting in Edinburgh, Scotland, for activists and lawyers who were already building campaigns against the JNF in their regions. The goal of the meeting was the development and international coordination of campaigns against the Jewish National Fund (JNF). The JNF-KKL is one of four founding institutions of the State of Israel. Israel was founded and continues to exist with the support of an international network of institutions that provide extensive financial and political support to the State. Before the State of Israel was founded, the Jewish National Fund was at the forefront of the colonial project of establishing a Jewish homeland in Palestine – already the homeland of the indigenous Palestinians. The campaign intends to expose and challenge the very premise of the State of Israel; it is not possible to build the basis for a democratic and pluralistic state through colonization and dispossession.